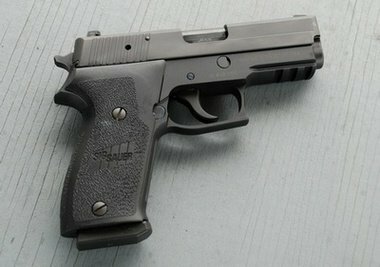 UPDATE 5/2012: This is the most updated gun review on the CGO site. Each time it has gotten better. I don't think I have owned any other gun that has grown on me, inciting better and better reviews each update. My hat is off to my Sig Sauer P220. It has grown to be a protection gun for self, home and vehicle. This month I sold it to a guy who snapped it right up without trying to bargain the price down. After four years of steady and dependable operation, it was time to trade and try (and review) other guns. But the Sig will be hard to replace. Honor to a gun I started off being not very flattering with. Sig produced a winner in my version of the P220. 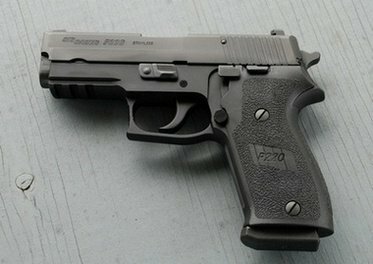 UPDATE 1/21/2011: The P220 is still with me and that says a lot about it for me to keep it this long. The gun has proven to be absolutely dependable with factory ammo and stays accurate even given little attention and cleaned only once in a while. I've let a lot of people shoot it, many of whom quickly decided it was their favorite gun. So, just a report to update an initial report that wasn't bad but wasn't flattering either. The gun lives with my family now. It is either in my truck, on my belt, in my boat or under my bed. It can fill just about any need for a dependable self defense handgun. The review below is not negative, but it is a little disparaging of Sig as far as the cost of their guns which I still think is a bit excessive. But if I was going to choose any steel gun to carry with a decocker, with the kind of function that is resident in the Sig P220, I don't think, regardless of the price that I would put my money in something else. Interestingly, this is a gun that has grown on me and is regularly carried in my truck. It also goes in my belt holster under a jacket, used as a home defense gun, thrown in a tackle box, and used for fun at the range. The gun has performed flawlessly. It's a "compact" gun, but is big, heavy and uncomfortable to carry. But in a pinch, carrying any gun of this kind, this would be my choice, even if I had to pay more for it and hurt a little bit carrying it. It is one of the few guns that I have that I will keep permanently because it fills a function in my life. Basic, tough, accurate, dependable, fun to shoot. The gun has grown on me and found a permanent home. 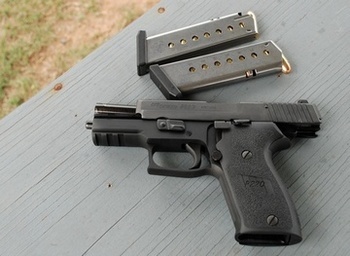 If this is the style of gun you need, you won't go wrong with the Sig P220, even for a bit more money. I picked up the Sig Sauer P220 in the photo new at Academy Sports. I had a first happen at the store too. I have bought so many guns from them in the last 2 years, that they did something almost unthinkable at a large discount store. Tthey actually ordered something from the warehouse for me. It took 10 days to get the gun, but the only one they had on display in the store had a nick out of the finish on the slide. And if I’m going to lay down $800 (with tax) for a combat handgun, I want to mess it up myself. Consequently, they ordered another gun from the warehouse, which I received 10 days later. The Sig Sauer P220 that I bought came with Siglight Night Sights which are tritium night combat sights that are highly visible in the dark. It came in a nice blue case with two 8 round magazines, a manual, a couple of decals (don’t ever put those things on your car), and the obligatory gun lock. The Sig Sauer P220 carried reasonably well in my Galco inside the waistband holster, though it took a little pushing to get it to seat. Because it sports a single stack magazine, the Sig Sauer P220 is reasonably thin and carries about like my full size GLOCK 22. Though with the hammer and a few protruding edges, it doesn't carry as comfortably. The finish on the Sig is a matte black Nitron® material that seems ok. However, it turned several different shades of gray after being in the holster under my shirt for a while. A little wiping got the consistent look back, but the long term wear remains to be seen. The grips on the gun out of the box are black polymer and are adequate. A set of Hogue grips would no doubt be nice, though not as concealable. Shooting the Sig Sauer P220 was fun. The gun was reasonably accurate with the sights as is out of the box. 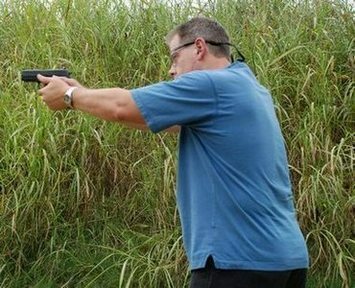 After 100 rounds of Winchester ball and hollow points and 100 rounds of my 200 grain reloads, I was shooting, reloading confidently. I was basically pleased with the performance of the gun. The trigger is DA/SA with the double action trigger pull coming all the way from Mississippi to get the thing from front to back. I mean llloooooonnnnggg, and heavy. The single action pull was crisp and Sig rates it at 4.5 lbs which felt about right. With the double action pull, I felt like I was pulling the trigger, double action, on a .50 cal revolver. The specs on the gun are as follows: Caliber .45 ACP; Trigger pull DA/SA; Overall length 7.1”; Overall height 5.50”; Overall width 1.50”; Barrel length 3.9”; Sights SIGLIGHT ® Night Sights; weight with mag 30.4 oz. ; Mag capacity 8 rounds; Grips black polymer. The frame is a lightweight alloy, with stainless steel slide (black coated). 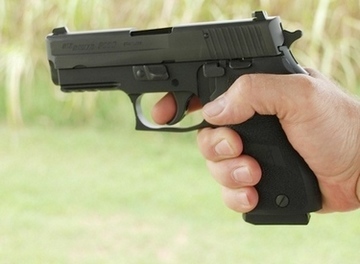 Now, what is important in this review is the overall impression of the Sig Sauer P220, since this one costs about $250 more than many brand name, high quality tactical handguns in this class. And in my humble opinion, to pay that much more for a gun, you should get …………$250 more of…..something for that money. Sorry to all the Sig fans, but that’s just not the way it is. The Sig is a good gun. It does what it is supposed to do. It looks ok. I expect it to be durable. But that’s it. Nothing more or magical because it has the Sig Sauer name on it. It’s just……average, which for today’s tactical handguns is good. But not $250 extra good. It’s not “better” than any GLOCK I’ve owned. 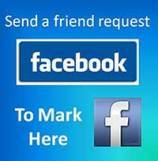 It doesn’t have any special operation or parts that are innovative or have any special significance. And this is going to be a real insult if you have a Sig fetish. It’s not better than any Taurus I’ve owned. It’s just good. The extra price of the gun just didn’t do anything magical for me when I shot it. BOTTOM LINE: I like the gun. But it is over rated. It is over priced. And if I didn’t have this web sight and didn’t do realistic gun reviews, I probably wouldn’t have given it a second look. Because today, with reasonably priced handguns of excellent quality, dependability, and durability, manufacturers like Sig Sauer need to do something to justify the extra cost of their guns ……….beside just putting their name on them. What I did with this review was just keep things in perspective. You can own a high quality, tactical handgun for $600 or less. And the performance will be as good as H&K, Sig and others that are also good, but over rated and over priced. But…….sigh…….you’ll probably see other higher priced guns reviewed here because…….it’s what I do.